In the Fall of 2017, I finally went to Boston and had the hip surgery that I had tried to fend off for way too long! As I expressed concern about returning home post-op and living alone with only my dog, my PT suggested (and my doctor seconded) that I pop by your “World Headquarters” in Northeast Harbor to introduce/acquaint myself with your staff and services. I met Elise and others. Everyone couldn’t have been more accommodating and nurturing, if you will. I left with a shoe horn, sock aid, raised potty, walker, a few other items that would soon become indispensable, and an anti-anxiety, secure feeling that I would be somewhat prepared for the ensuing journey of recovery. Once back on MDI, Elise and the MDNA team came by the next morning. She & Company hit the ground running—checking my vitals, setting things up, throwing in a bit of PT for good measure. Both the friend who had transported me home and I were amazed at the convenience and proficiency of the service. Relief was the word that kept popping up. However, Elise did dash our plans for a Friday Night trip to the movies at Reel Pizza. My friend returned home but was so impressed with MDNA that he even left a donation! Now alone, I enjoyed the warmth and comfort of Indian Summer on the Sound—all and only possible because of MDNA. I was so glad to be away from hospitals and inspired to learn all I could from your staff to be able to take care of myself so as not to have to return to the hospital. There were many ground-zero, re-learning moments in the complicated process of recovery but everyone at MDNA was incredibly considerate, patient, and proficient. MDNA staff provided me with the critical morale boost I needed during the 2 weeks under your care. Marti taught me how to breathe/exhale properly when doing my exercises. She also taught me how to get in and out of my car with ease —to say nothing of the many simple, take-for-granted tasks of daily living. I could go on in praise of MDNA. The agency was a wellspring of relief for me during that critical period of my recovery. MDNA was the bridge between the inpatient care and the excellent outpatient therapy. That bridge makes MDI a perfect place to recover from surgery. Thank you so very much for all of the professional assistance you have provided over the many years for my Mom. Not only were your services professional but they were performed efficiently and with much love and care. Notwithstanding all that you did for Mom we can’t thank you enough for the support you provided for Tanis and me. You were always there to listen, help and put in the extra effort. Neither of us were prepared or trained for what the final end presented. My Mom was a wonderful lady, very determined in her elderly years. At times this was a wonderment and at times a hurdle. As hard as everyone tried, Mom could resist. And yet you all never gave up… Thank you, thank you. My wife Tanis was more involved than I and not a day would pass without her praise and thankfulness for your non-judgmental support. We live in a small community that has very limited resources and your is certainly one of great value and necessity. May many others receive your gift!!! Thank you from the bottom of our hearts. MDNA nurses have visited and taken care of my mother for over 8 years. This in-home nursing care has been has been an incredible service to me and my family. As the primary care-giver among my siblings, it has meant so much to me to have professional nurses assess and assist my mother. and provide resources for me. The professional skills of these nurses, Emma and Theo, and their regular weekly visit to my mother have meant that potential problems have been recognized before they became emergencies. In the office, my questions have been answered by another nurse, Anne, and I have been helped in finding resources for my mother. Their presence and availability takes such a weight off my shoulders. Through the efforts of the MDNA nurses, my mother, at age 95, is still able to live at home, and I have the reassurance that she is being monitored and cared for on a regular schedule of visits, with extra visits as needed. My mother looks forward to these visits, and has great faith and trust in Emma and Theo. 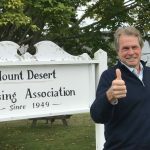 The Mount Desert Nursing Association is a real town treasure. I cannot imagine what I, or the residents of Mount desert, would do without the nursing care, concern and knowledge provided by these wonderful nurses and this outstanding organization. Helping my elderly parents stay in their own home is no easy task. Living nearby allows me to check on them, but we couldn’t do it without the Mount Desert Nursing Association. At least once a week, Theo or Emma visit my parents and do a full physical and emotional assessment, which includes heart, lungs, nutrition, weight, intestinal and urinary tracts, skin, foot care and setting up their medications for the week. They also monitor the side effects of their medications, and contact the doctor and other essential community resources when necessary. For me it is another set of eyes. The nurses can pick up on something I may not have noticed. I get feedback from Emma and Theo about my parents’ health. They tell us when to pick up prescriptions and I also have their support and counsel when days are overwhelming. The nurses are there to listen to me and help in any way they can. The nurses come to my parents’ house with a smile and a hug. Mom and dad look forward to their visits. What would we do without our nurses from MDNA? We would like to commend the Mount Desert Nursing Association. Patricia recently had major surgery at the MDI hospital. We returned home needing to attend daily to her incision as it healed completely. Theo Hinckley, RN from the (MD) Nurses Association visited us each week. The visits by an experienced nursing professional were very helpful and gave us confidence that all was progressing well. We are fortunate to have this service in Mount Desert and people who could benefit from this wonderful service should use it. In the past we have made modest donations to the privately funded Nursing Association. Had we known just how much value this organization adds to our community our contributions would have much more generous. We encourage people to learn more about the Mount Desert Nursing Association and to support them with your contributions.